Dhaka – A faction of Bangladesh Chhatra League, the student wing of ruling Awami League party, locked in a clash with police on Chittagong University campus on Sunday paralyzing academic atmosphere in the university. Police in riot gear were seen, in video footage, chasing the activists who were protesting against arrest of six fellow activists allegedly arrested in false cases. 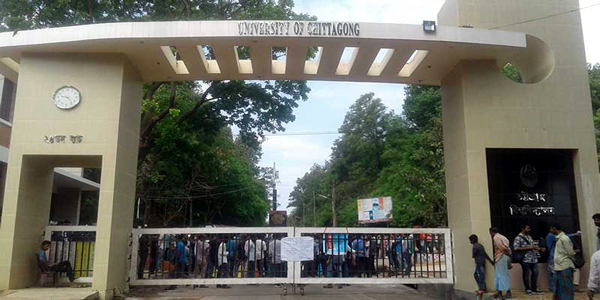 The protesters also demanded resignation of Ali Asgar Chowdhury, the proctor of the university. Witnesses said the activists blocked the roads, prevented students from joining classes as they brought out procession to press their demands. The protesters also blocked the shuttle train service that connects the university and the port city. At one point, police tried to disperse the crowd using teargas and water cannon. The activists also retaliated with brickbats turning the campus into a battle ground. The activists have been asking for resignation of university proctor and withdrawal of the officer-in-charge of Hathazari Police Station. They said the six Bangladesh Chhatra League activists were charged in false cases under Arms Act.